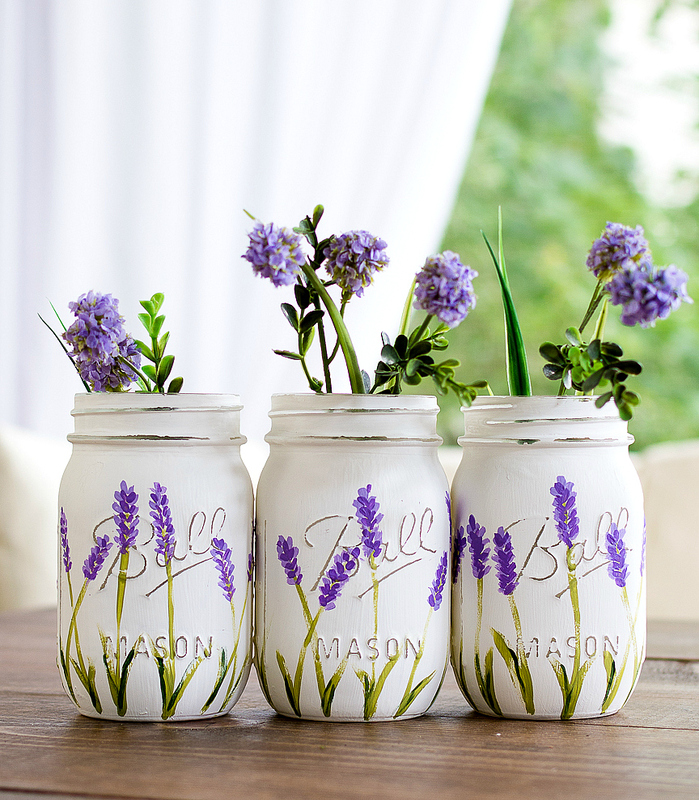 Lavender Flower Painted Mason Jars. So you know I like to keep it real around here, right? Tell it like it is. 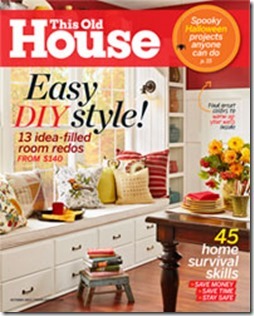 Share it all – well, all as in all the crafting and diy-ing and cooking – warts and all. Served up with a side of sarcasm, of course. 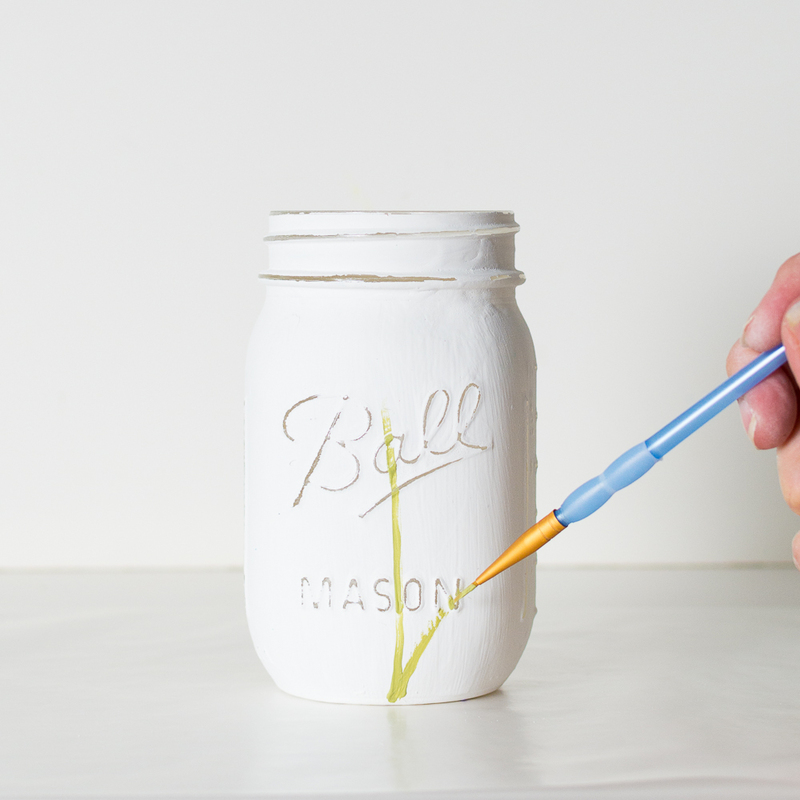 The truth is, I have a love/hate relationship with mason jars. Phew (as wipe the sweat away from my forehead with back of my hand). There. I said it. It feels good to get that off my chest. Now, granted, this love/hate relationship is irrational. I realize that. 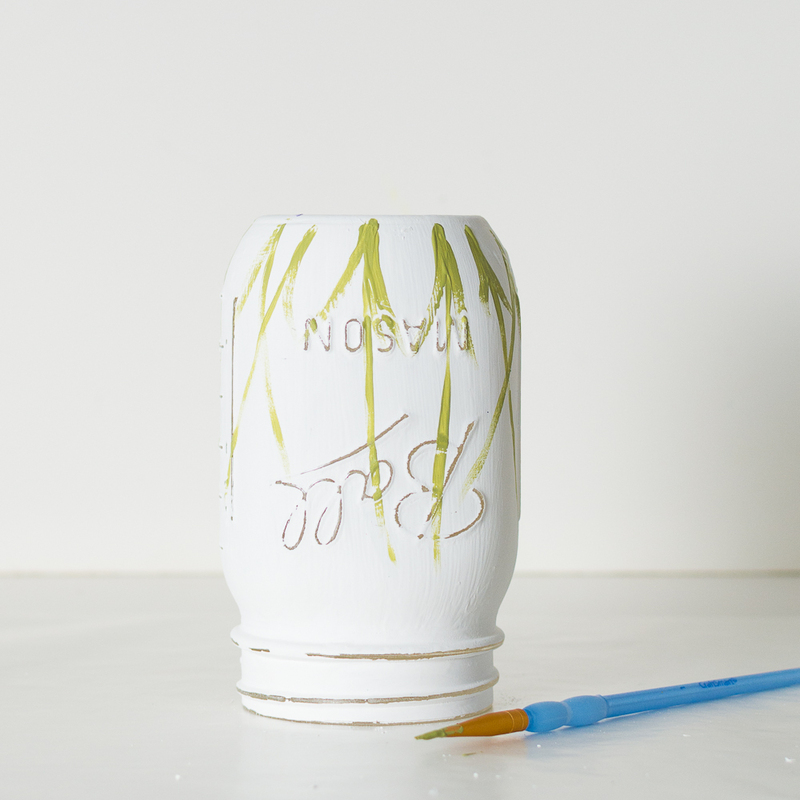 You see, when I look at the numbers — and when I say numbers I mean traffic coming to this blog — it becomes clear that people are coming here to look at my mason jar creations. and the very same traffic that has created my irrational love/hate mason jar conundrum! 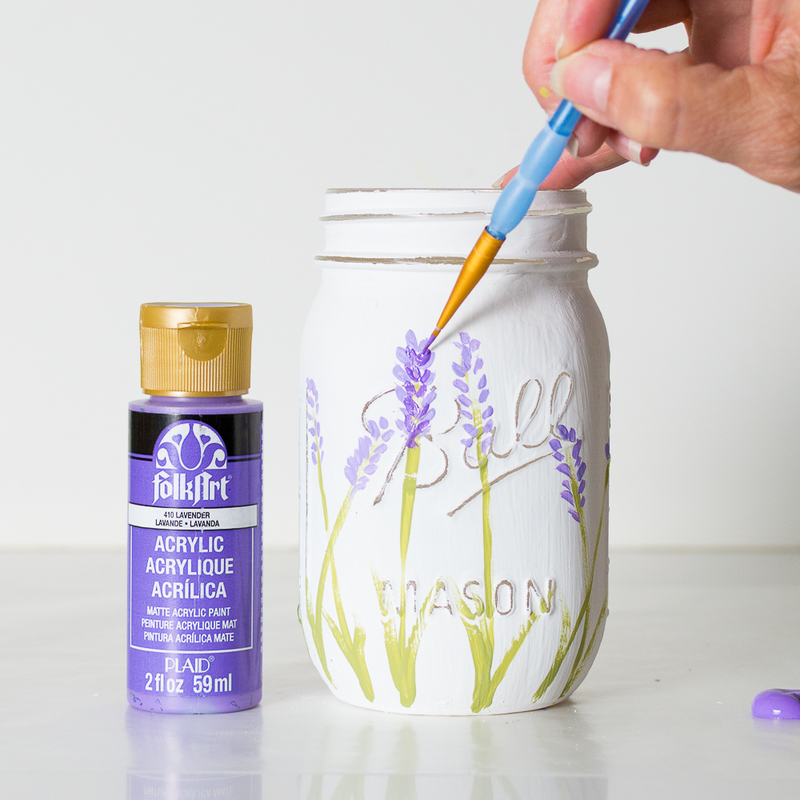 Next, using light lavender acrylic paint, I create the lavender flowers by just dotting along the stems. 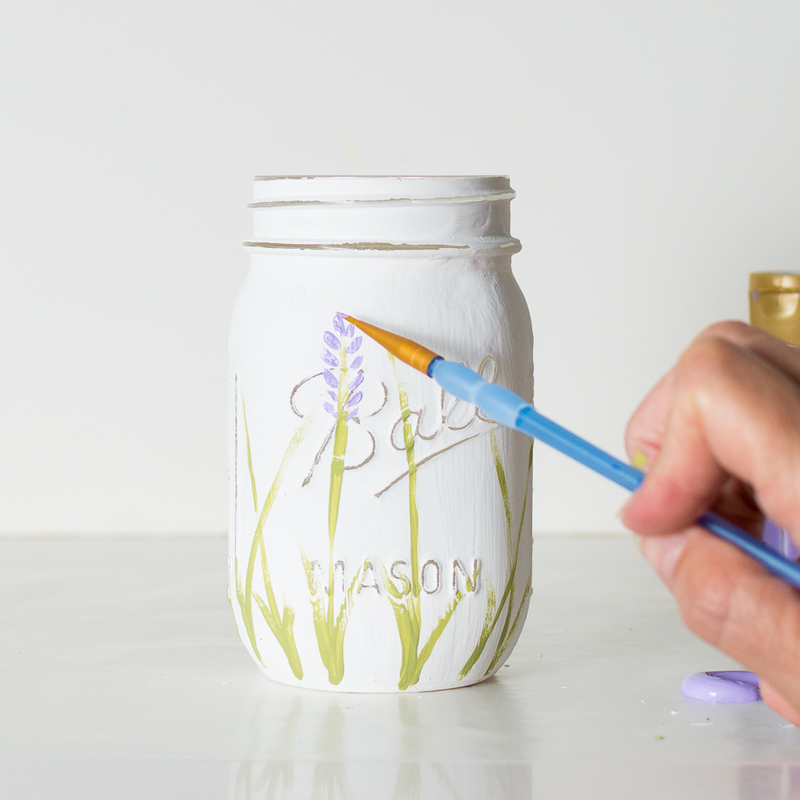 Once dry, I added depth to the flowers — and filled in empty spaced — by dabbing on a darker lavender. I then dry brushed on a darker green on the leaves. 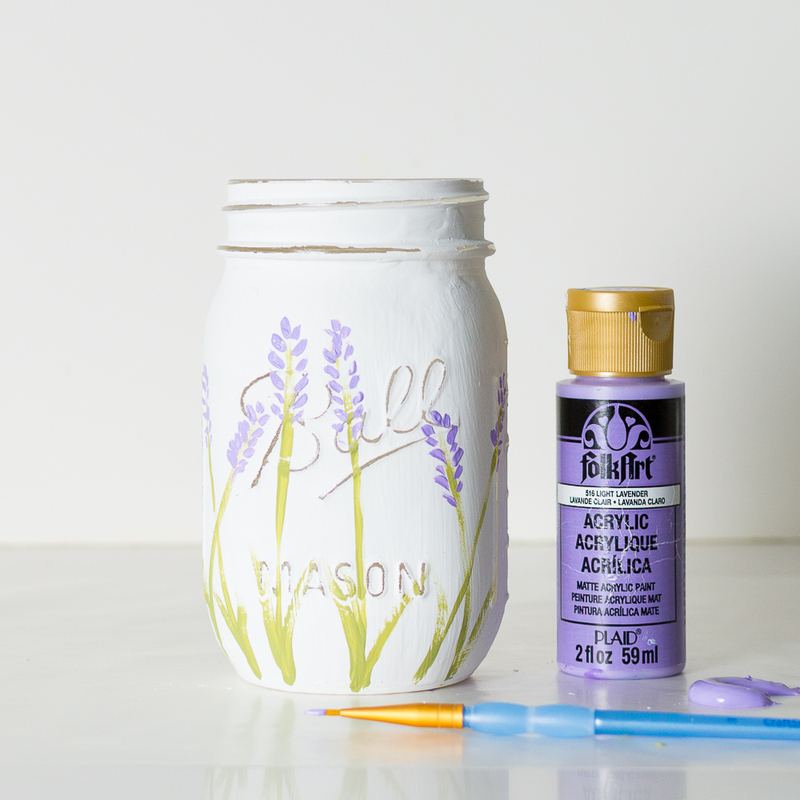 And if you would prefer for me to make these lavender flower mason jars for you, I have them listed at the Etsy shop here and here. 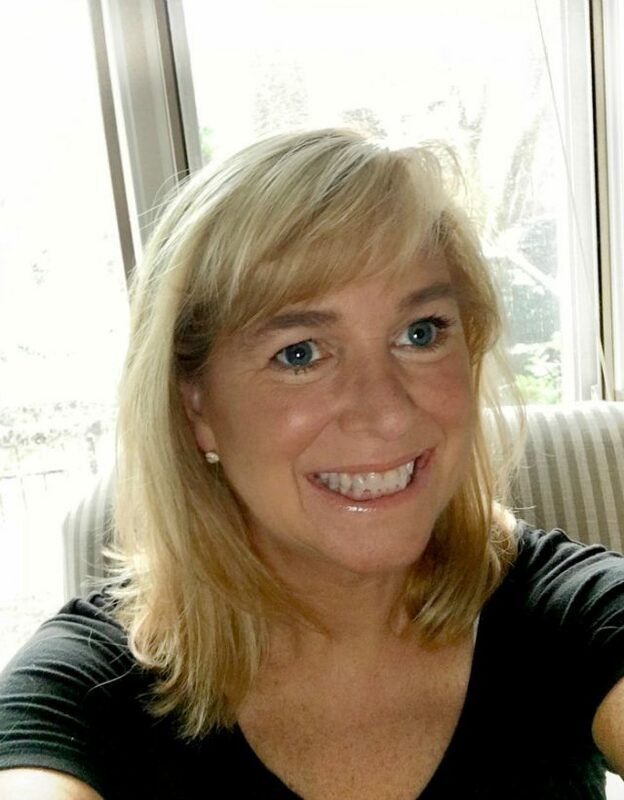 Linda, I last wrote to you after your basement flood. Writing again in hopes of cheering you. When I first discovered home-type blogs and gradually grew to rely on them for expanding my own little world and negligible craft-type skills (ages ago), yours was one that stayed in my life. You’re a writer, literate, which ranks very high for me. Although I’ll agree with you and express some fatigue with mason jars, ubiquitous now, I see by this lavender painted mason jar post that there’s still something new under the sun in the mason jar world–it’s lovely, transcends what came before; and the fishnet one is wonderful too, well done!–as is the Linda Signature black and white stripe. It’s absolutely stunning that your specific mason jar craft and attendant ad revenues have contributed to increasing your son’s college options so significantly!! I’m in awe. Congratulations!! On hard steady work, persevering, and reaping the rewards!! Your greatest talent may in fact be putting one foot in front of the other. Speaking to your other design work, I love the way you transform the rooms in your home and especially love your painted rugs. Which I aspire to. I myself plan a lotta stuff but follow through on comparatively little. I’ve got years-old raw wood trays and art papers to decoupage and paint, and a (growing–oh, no) collection of old wood chairs, bureaus, and tables for which ASCP is planned, with paint cans of half her colors and waxes in my home: waiting. Thus it’s important to me to see examples such as yours! I don’t want to lose the desire to “make something” because wanting to “make something” is a happy thing, a hopeful thing, and goodness knows the more of that, the better. Well, that’s all I got. Keep up the good work. you are so talented- these look phenomenal!!! 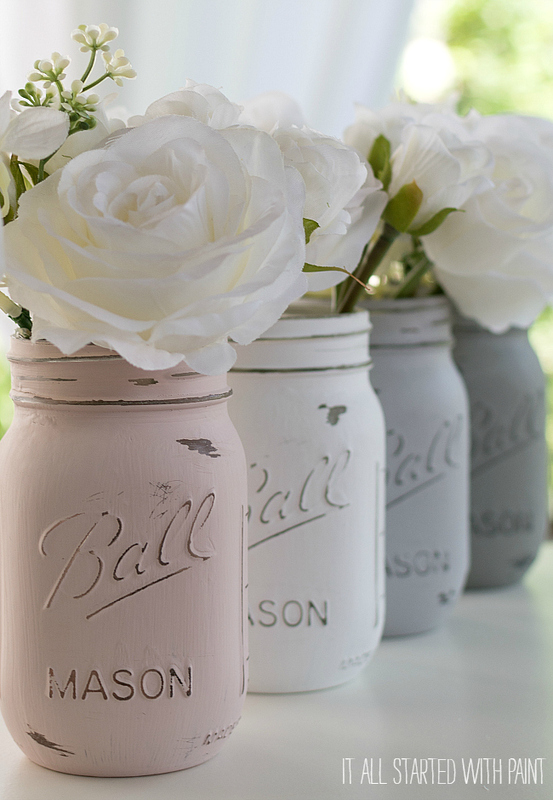 …but no one does Mason jars the way that you do Mason jars. And we look to you as the font of all Mason jar wisdom. 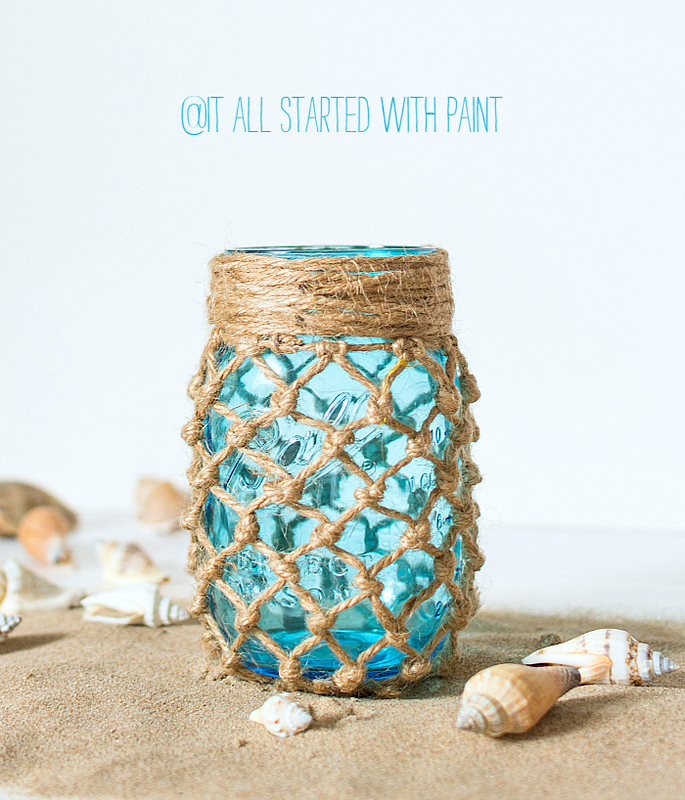 You are setting an example for not just Mason jar guru wanna-bes, but also to those women who want the flexibility to stay home and contribute to the family coffers…something that never worked out for me. Power on, my friend! LOL! You win wittiest comment of the day! 🙂 Seriously. Thanks for the lol! 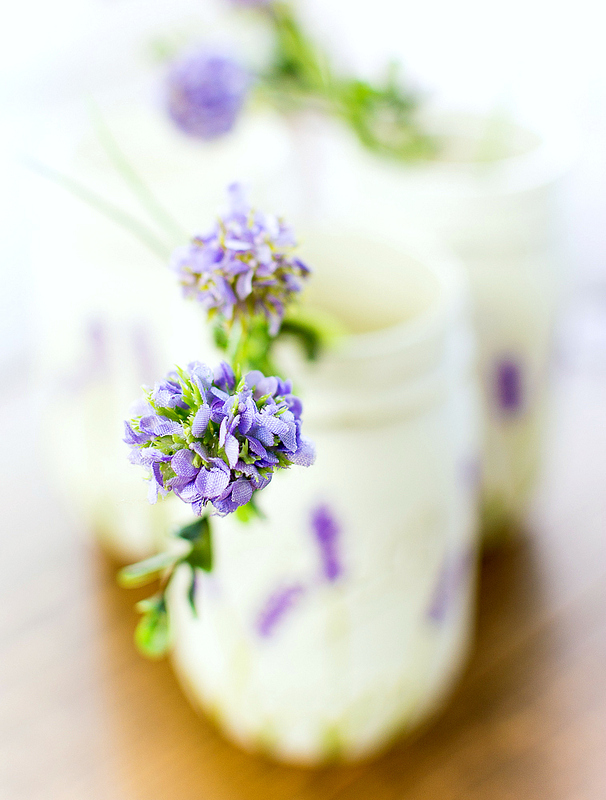 LOVE, LOVE, LOVE the lavender jars!….Beautiful job Linda! 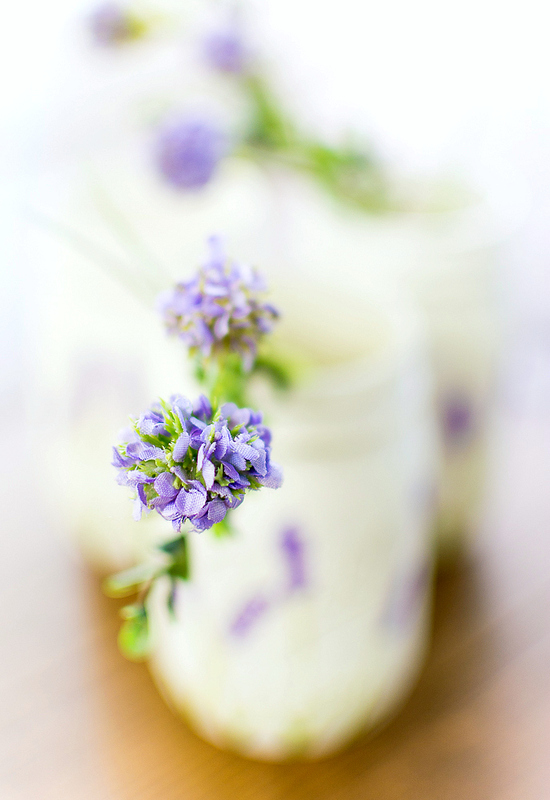 Linda, just so you know I follow your blog for the words and fun, not the mason jars. Linda, I love your mason jars, I really do, however they are the last reason I come to visit you. I come here because I love your sense of humour. I love that you come across as real, even sharing your little insecurities sometimes. I love, love, love, that you’ve shown me a different look of Chicago, a city I always thought was too big and very windy. I love the way you decorate your home. A real home, that I’m sure makes everyone that enters it feel comfortable. Most of all I love that when I visit here, I always get the feeling, that if I lived just down the street from you, that sometimes we would get together , have a coffee, swap recipes and have a good laugh. Your site is a fun place to visit. I also enjoy the way you write and talk about things, which is a huge draw to keep coming back. 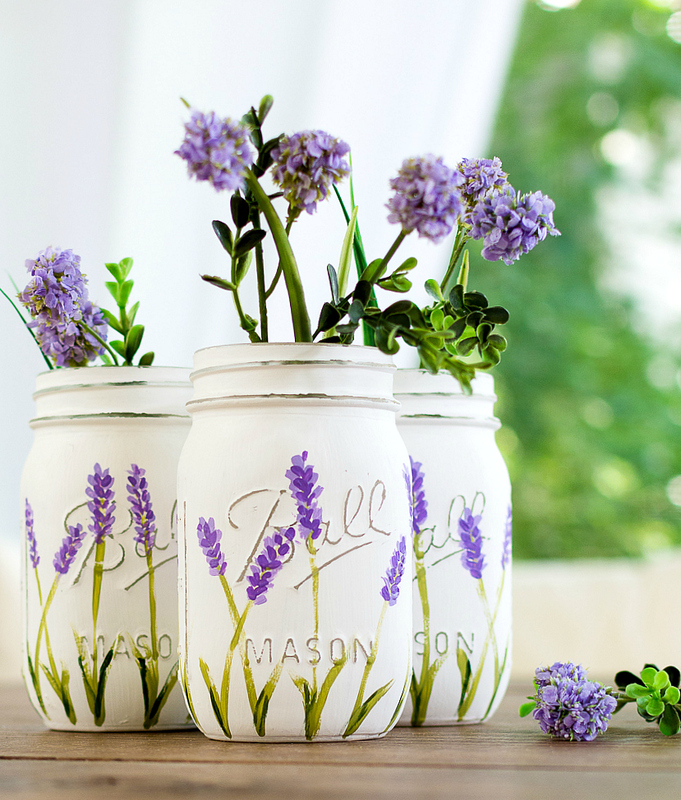 Oh, and these lavender mason jars are indeed adorable. Ironically very spring-like even though we’re heading into fall. I tried this. Made mine in a hurry and a little more impressionistic. Should’ve read your blog before trying. I’d love to send you a picture. I just stumbled across your blog, and I love it. 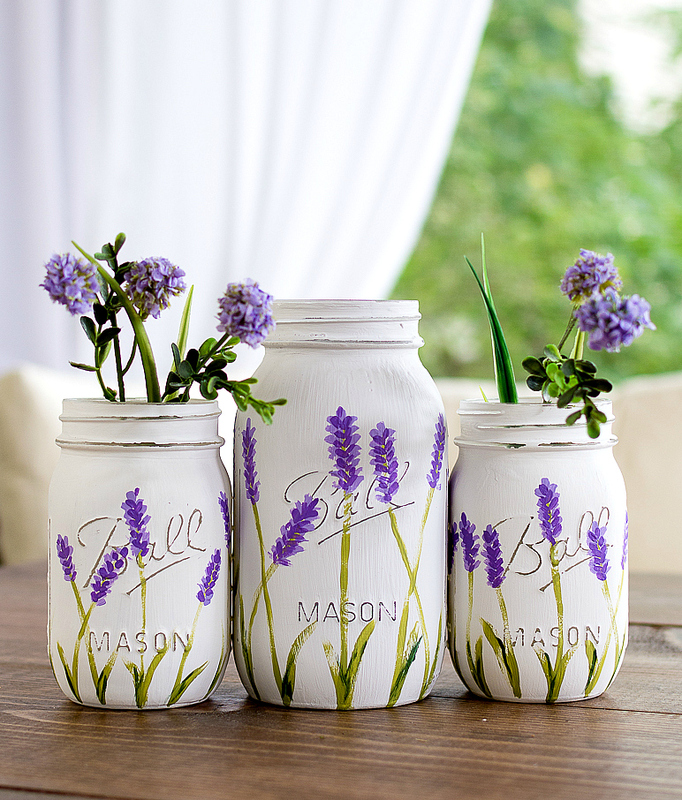 Ooo I love lavender therefor love these mason jars! 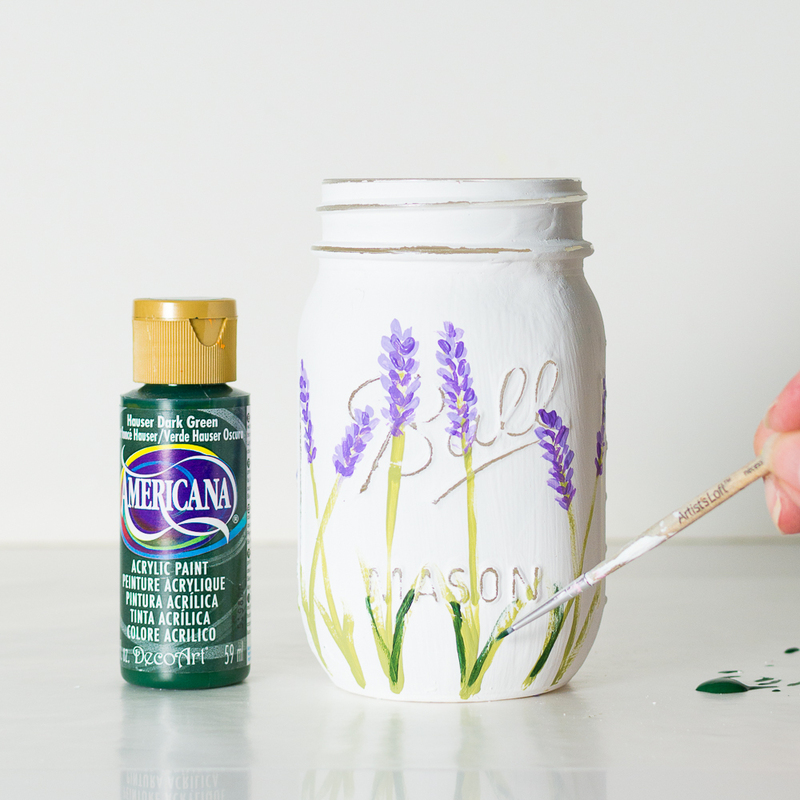 I’m not to crafty with paint, but am thankful you have awesome pictures and a step by step guide. 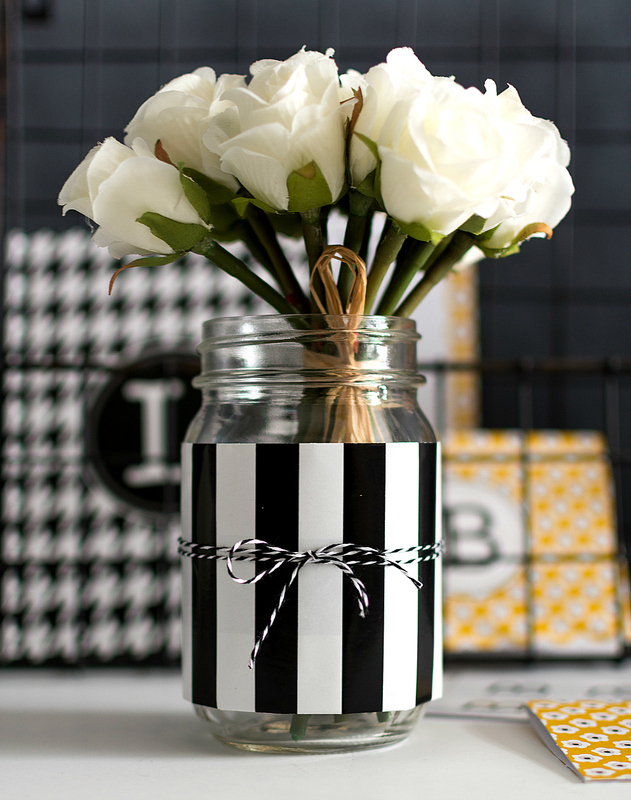 Will hope to be making these soon for a centerpiece. Thank You! Good luck! Just remember not to judge along the way. Wait until you have a finished product! 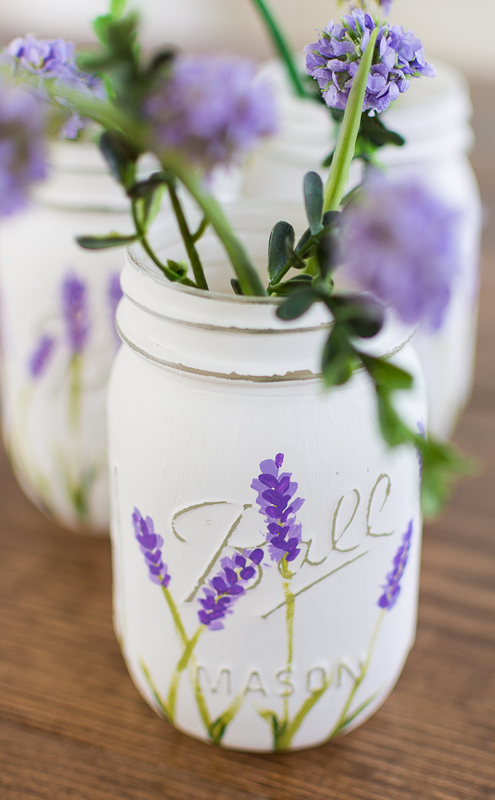 I use a mix of chalk paint (the white base is a Rustoleum chalk paint product) and acrylic (for the actual flowers). I do use a clear coat sealant on top. However, you can’t wash them or the paint could run/come off. You can use a swiffer and a slightly damp rag to wipe them down. Hope that helps! 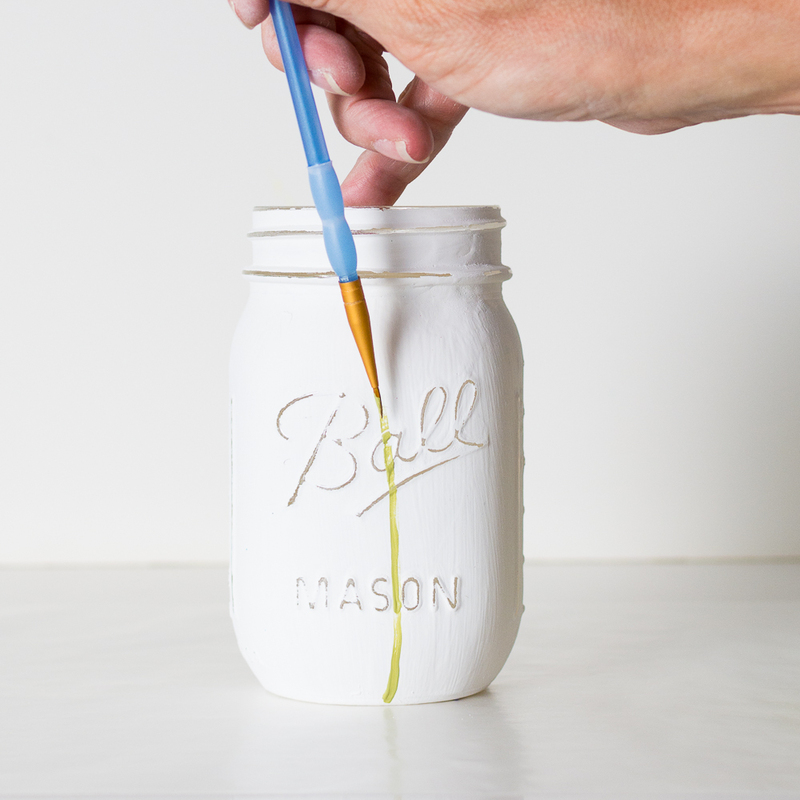 Now, as far as these awesome mason jars…You make it LOOK so easy. I HOPE mine come out half as pretty as yours. With the new found inspiration, and your step be step instructions, I am hopeful. Well, its off to discover I go.